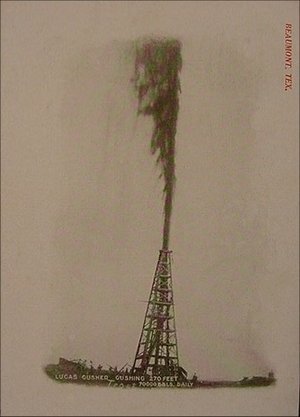 Spindletop, When oil became an industry. January 10, 1901: Patillo Higgins' theory that a large pool of oil awaited discovery under a salt dome located south of Beaumont came true. Higgins had spent most of the previous decade trying to convince others that this was so and raise capital to drill a discovery well. 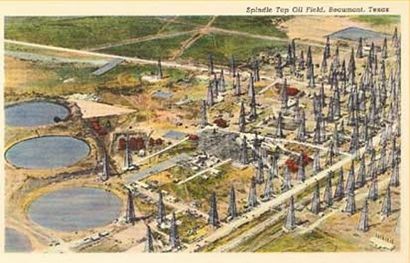 The site was first known as Gladys Hill, and later as Spindletop, named for a tree growing there that resembled a child's toy. Higgins first partnered with George O'Brien, George Carroll, Emma John, and J.F. Lanier in the Gladys City Oil, Gas, and Manufacturing Company, but their shallow wells failed to locate oil. Later a Czech engineer, Anthony Lucas, joined the search in 1899, and before the discovery well blew in he had taken in so many partners to raise capital to keep going that he retained only a small interest. The Spindletop gusher was located on land owned by the McFaddin, Weiss, and Kyle families, adjacent to dry holes drilled earlier. The discovery well blew out six tons of drill pipe with sufficient force to sustain a 100-foot geyser of oil until capped ten days later, and flowed an estimated 100,000 barrels daily. By the time the well was capped the drilling rig sat in a lake of oil. Spindletop changed the world. Coming about the time the internal combustion engine was adopted by the new automobile industry, it perfectly fulfilled the supply-and-demand symbiosis. Great 20th-century companies, notably Gulf Oil, TEXACO, and Hughes Tool Company, were born in the race to get rich from Spindletop's black gold. In this 100th year since the efforts of Higgins and Lucas paid off so handsomely, there will be much remembering. My own memories drift back to the 50th anniversary, when I was a freshman in French High School in Beaumont. That celebration was called the CavOILcade. I remember watching a parade go "up Pearl and down Orleans," the principal streets of Beaumont's business district. It featured movie stars Robert Cummins and Theresa Wright, though I haven't a clue why. I remember interviewing leather goods merchant I.W. Ableman to write an article for the French High Echo -- even then I fooled around with newspapers. Ableman was an enterprising young man in 1901. He collected empty bottles behind saloons, filled them with oil from the lake created by Spindletop, and sold them for $1 each to tourists who had ridden special excursion trains from Houston and New Orleans to view the phenomenon. By then oil sold for only 10 cents a barrel at the well head, such was its abundance. Spindletop offered many ways to make a buck.